This Turquoise Howlite jewelry set will give you a colorful and bright look. Laced with bronze plated Tibet silver, the pieces are perfect all occasion fashion accessories and can be paired with any outfit. 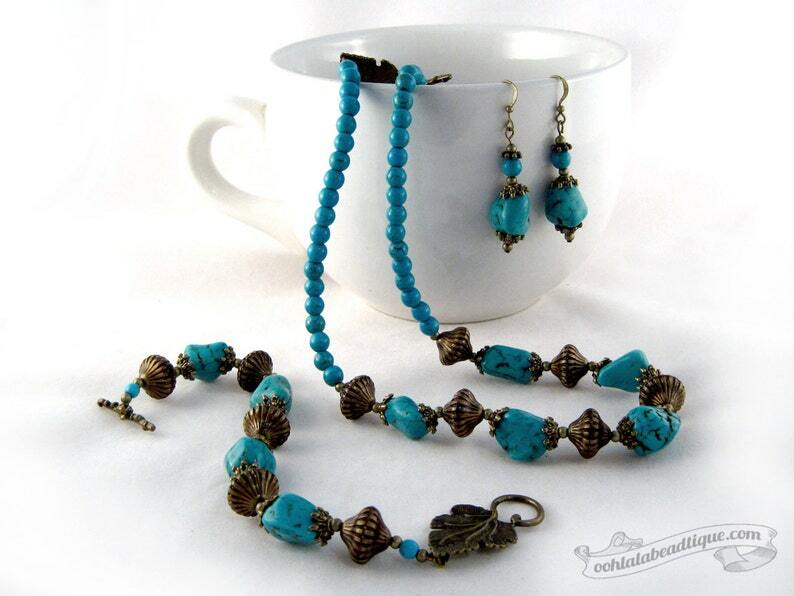 Turquoise Howlite, and bronze plated Tibet silver are combined together for a stylish look. The necklace, and the bracelet are strung onto tigers tail wire for strength, durability and drape. Finished off with an ornamental leaf shaped toggle clasp. The earrings are strung onto bronze plated wire. The necklace is approximately 18.5 inches long including the clasp. The bracelet is approximately 8.5 inches long including the clasp. The earrings are approximately 2 inches long including the hooks. 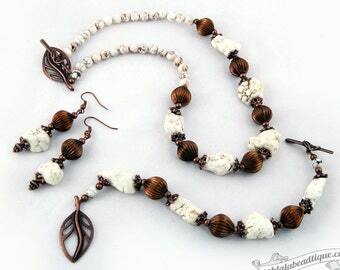 Howlite is a extremely calming stone. It stills the mind and is excellent for sleep or meditation. The stone allows for calm and reasoned communication to take place, and it teaches patience. It formulates ambitions, both spiritual and material, and aids in achieving them. In addition howlite also helps to overcome a tendency to criticalness and selfishness, strengthening positive character traits. This stone strengthens memory and stimulates a desire for knowledge. Many Ooh-la-la Beadtique handmade products are crafted using natural components such as semiprecious stones, freshwater pearls, and wood. No two materials in nature are alike. 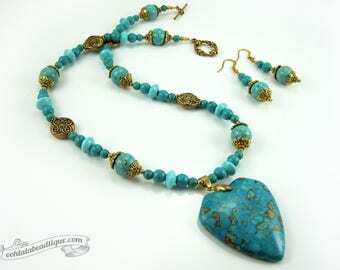 The handmade Turquoise Howlite jewelry set that you will receive may slightly vary in shade and texture pattern from the picture listing. Also note, that all monitors and computer screens are calibrated differently. The same product may appear in diverse colors on different monitors.